Tired of having to walk around and pick up branches before mowing? Let this Billy Goat TKV650SPH Lawn and Litter Vacuum tear up branches with the on-board 2 inch chipper, while picking up other leaves, mulch, debris, and litter. 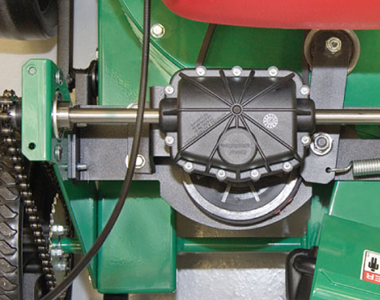 The self-propelled wheel drive system eliminates pushing while pulling this vacuum up hills, slopes, and making it easier to maneuver on wet grass. Increased productivity of 17500 sq. ft. per hour is available with the 187cc Honda engine. And, a 40 gallon zipperless mesh bag with marine-style fasteners, collects dirt and debris for reduced dumping time. Powerful Honda Engine: Clear areas up to 17500 sq. ft. per hour with the 187cc Honda engine. Self-Propelled Wheel Drive System: Simplified operation is enhanced with the self-propelled wheel drive system for minimized struggling on hills, and uneven terrain. 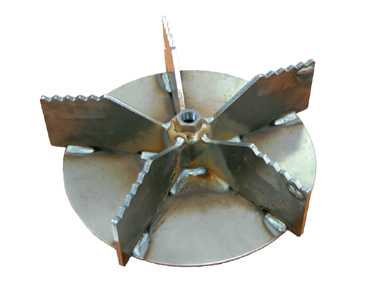 5 Blade Impeller: This 5 blade impeller is equipped with serrated edges to chop up objects for better debris pick up and suction. 2 inch Branch Chipper: A 2 inch branch chipper allows you to add branches to your pile of leaves, twigs, and other debris. Just let the 2 inch chipper obliterate the branches into pieces. Materials: Pick up leaves, seeds, mulch, blooms, branches, litter, and debris. Internal Dust Cover: Dust is diverted away from the operator with a dust skirt to keep you moving forward without debris getting in your face or eyes. Zipperless Mesh Bag;Debris is collected in the 40 gallon mesh zipperless bag that is equipped with two convenient marine-style fasteners keep the bag shut for simple loading and unloading. 12 Inch Wheels: The 12 inch wheels move easily over rough, hard, or soft terrain to keep you gathering debris. Warranty: This machine comes with a reassuring 1 year machine warranty, and 90 day Briggs engine warranty. I have a lot of oak trees in my yard and was having a lot of leaves constantly. I just bought this Billy Goat and It does a great job of mulching them and bagging them very quickly. I am very glad I purchased this. Worth the money in my opinion. Dollar for dollar this is the best piece of equipment that I have ever bought. I have just turned a 4 hour job into less than 1/2 hour with better results. We have a lot of very large trees that dump truck loads of leaves and branches so this is a life saver. This machine will eat anything you feed it, unlike the shredder/vac that I was using before that would get jammed with the smallest piece of wood from mulch or just a twig. A powerful Honda engine and sturdy built machine that is so easy to operate that my wife loves using it, you cant go wrong here! The Billy Goat is a great leaf vacuum, sure beats raking. It is a bit difficult to dump the mulched leaves, but we're sure that with time and practice it will become easier. I have trouble with the pull start, but I'm an old weak wimp. Doesn't seem to be a problem for my husband at all. Mulches the leaves nicely, making great mulch/compost. We got the chipper, which I love. Chips the small branches and sticks quickly and efficiently, more mulch! Over all we're very glad that we purchased the Billy Goat and look forward to it helping us deal with our massive leaf clean ups year after year. Wish we'd done it sooner! It is very loud (the manual says 120dB). It vacuums quite well, although sometimes you have to pass grass with leaves several times before it catches everything. The Honda engine is great and quite easy to start, just be sure to put in a quality oil and change it regularly. Picks up good but throws out a lot of dust. Ask us about the Billy Goat TKV650SPH 187cc (Honda) Multi-Surface Self-Propelled Leaf Vacuum (w/ Chipper) . Please no repair questions. Your Q&A may be posted to MowersAtJacks.com to help other shoppers, like you, with their purchasing decisions. Thank you. does it come fully assembled, does it take gas or a mixture of gas and oil? Mark, this leaf blower will come completely assembled minus lifting the handle, adding a few bolts. This particular leaf blower will most likely take regular gas, however, it will tell you in the manual once received. 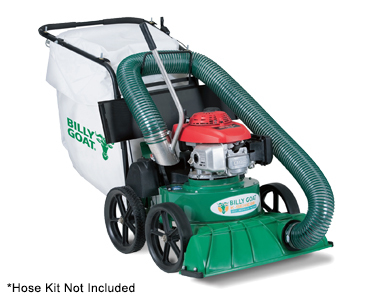 Add options now for your Billy Goat TKV650SPH - Lawn Vacuum at a 1 time discounted price. When you are ready to check out, just click the ADD TO CART button. Description: Clean hard to reach places with this 4” X 7’ KV optional hose kit that has an ergonomic telescoping handle.